Mike Peters Rocks Rhuddlan. An amazing day saw Mike and a band of trekkers scale Snowdon, then Mike Rocked Rhuddlan! 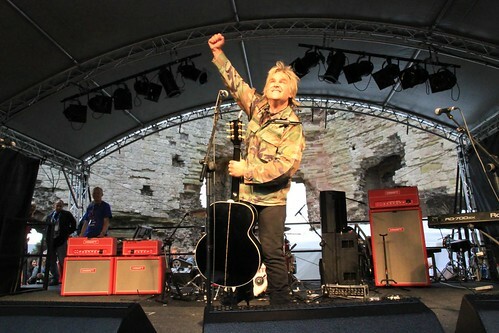 Mike Peters pulled off a remarkable weekend for his charity, Love Hope Strength, hosting a 6 am hike up Snowdon with 150 trekkers, followed by a sell out concert at Rhuddlan Castle on the same day. Mike was joined on stage by The Levellers, who made a massive overnight journey from Inverness, Scotland to be at Rhuddlan Castle Rocks. Simon Fowler from Ocean Colour Scene made a surprise special guest appearance and Mike and The Alarm joined Simon on stage to perform their massive hit, ‘The Day We Caught The Train’. The Alarm treated the audience to a medley of Top 20 Hits ‘Rain in the Summertime’ ’68 Guns’ and ‘Spirit of ‘76’. Mike was also joined on stage by very special guests, actors, Phil Daniels and Keith Allen for a stirring performance of Love Hope Strength, the signature tune of Mike’s foundation. During the build-up to this year’s event, Mike Peters and The Love Hope Strength Foundation have attracted incredible support from all over North Wales which saw Mike Peters performing a marathon acoustic busk-athon at all three North Wales. With the support of Barclays, Mike Peters has been performing and raising cancer awareness outside and inside local branches of Barclays bank, inspiring many of the local staff to climb the mountain with him. Mike summitted Snowdon at 11am and was joined by trekkers from Saints Health Club, Meliden who cycled from Meliden to Snowdon, climbed the mountain and then cycled back to Rhuddlan in time for the concert!!!! At the Faenol Fawr Country Hotel, Bodelwyddan on the night of August 6th, Mackenzie Jones’ Solicitors in conjunction with Love Hope Strength Organiser, Jules Peters, hosted a summer ball to benefit Love Hope Strength with Mike Peters in attendance and also a team of 12 international trekkers, some of whom travelled from as far away as Mexico and Norway to climb Snowdon. On Fri afternoon, Mike and wife Jules also showed LHS supporters around the North Wales Cancer Treatment centre in Ysbyty Glan Clwyd Hospital earlier that same evening to demonstrate where Love Hope Strength monies are spent. The N Wales community has pulled together for this special Castle Concert performance with the assistance of Chief Superintendent Simon Humphreys and the local police force (who co-ordinated the movement and safety of fans throughout the day on a voluntary basis), and also commitment from local-born Simon Talbot (Fire Safety Enforcement Officer), and the North Wales Fire Service, Rhyl. Fire extinguishers were donated by North Wales Fire Protection. Catering for the band and crew was kindly donated by Mark & Anna MaCauley at the Blue Lion Cwm), with waste removal donated by Tim Harper at Thorncliffe Bulding Supplies). The disabled viewing platform was donated by Netwell Scaffolding, Dyserth.